To enter Fosterfields, a working farm since 1760 and New Jersey's first living, historical farm, is to magically step back into the 19th and early 20th centuries. Walking amidst the tall Norway Spruces, it is easy to imagine life in the days of Caroline Foster, who lived there for 98 years, until her death at the age of 102 in 1979. Today, it is still possible to see cows being milked "the old fashioned way," and to visit the Carriage House, used as a Republican voting place in the 1890s, which houses the Foster family's Runabout and Caroline's sporty Tandem Gig. In early Spring, just after the Farm's opening, the antics of newborn piglets and lambs delight children and adults alike, and little voices beg, "Could we get a pig, Ma? Could we buy a lamb, Dad?" Beginning on opening day on April 1st and continuing through late October, an exciting array of activities and demonstrations, including Caroline Foster's birthday, sheep shearing, potato and corn planting, butter making, black smithing, cooking at The Willows and the Civil War Weekend, take place at Fosterfields. Many events are "Help the Farmer" activities, wonderful learning-through-fun experiences for both children and adults. 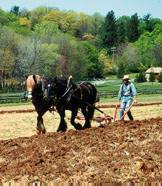 Jersey cows, draft horses, chickens, pigs and sheep populate the Farm, and demonstrations of butter churning, cream separating, corn cracking and other domestic farm chores are scheduled throughout the week. Visitors will learn of Caroline's world as a young socialite and self-described "First Women's Libber." The Creamery, where cream separation and other dairy processing such as butter-making took place, is one of several buildings open to visitors. There, warm fresh milk from the Farm's Jersey cows was cooled by the natural spring which still flows through the basement of the Creamery. Its upper level was used as a bunkhouse for hands hired by the month who received $15.00, room and board, and only a stove for heat. In her later years, Miss Foster was asked if the hired men knew about farming. "Yes, people in those days knew how to farm," she responded. "Now they wouldn't know which end bit and which end kicked." The Willows, a charming 19th Century Gothic Revival house listed on the National Register of Historic Places and home of Caroline Foster and her father, Charles, is a delight to behold. In this house, built by Joseph Warren Revere, grandson of Paul Revere, Sunday meals are prepared twice a month on the Fosters' original wood burning stove. If you are fascinated by the past and love the holiday season, a visit during the December Holly Walk will introduce you to the cozy ambiance of The Willows, decorated in seasonal splendor as it was in Miss Foster's day. Visitors will learn of Caroline's world as a young socialite and self-described "First Women's Libber." An avid hunter and fisherman who favored sports and outdoor activities over traditional "women's roles," Miss Foster also enjoyed carpentry. When life under "Pa's thumb became a bit too confining for her free spirit, Caroline constructed her own cottage, the "Temple of Abiding Peace," on the grounds of Fosterfields as a temporary respite from life in the main house. Her cottage also is open to Farm visitors. It would be impossible to speak of Fosterfields without mentioning the beauty of the land itself. 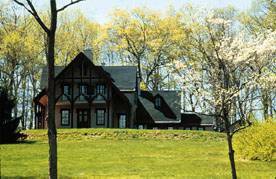 In typical Morris County Park fashion, the grounds of Fosterfields are immaculately maintained. Tall Norwegian Spruces line a country road leading to a striking stone arch and, eventually, to The Willows itself. Sitting on the porch of The Willows and overlooking the farmland below, it is easy to understand why Caroline Foster remained at Fosterfields for 98 years. Such extraordinary beauty would be hard to duplicate. In this quiet world, cows moo and sheep graze, and there is the feeling of having stepped out of the "real world" into a more peaceful, simple past. Thanks to the Morris County Park Commission and the vision of Caroline Foster, visitors will return time and again to experience the magic and wonder of Fosterfields Living Historical Farm. Fosterfields Living Historical Farm is located at 73 Kahdena Road, Morristown, NJ, just off County Route 510 (formerly Route 24), 1-1/4 miles west of the Morristown Green. The Farm is open Wednesdays through Sundays from April through October. For more information, admission prices, directions or maps, call 973-326-7645. The Raptor Trust is one of the premier wild bird rehabilitation centers in the United States.